Kauai is a place of adventure, where there are endless possibilities to enjoy the great outdoors. The island is absolutely gorgeous, and it truly makes you wonder how a place so beautiful even exists. With so much of the island natural and untouched, I thought finding a great place to eat would be challenging. I was wrong! I enjoyed a variety of foods on Kauai. 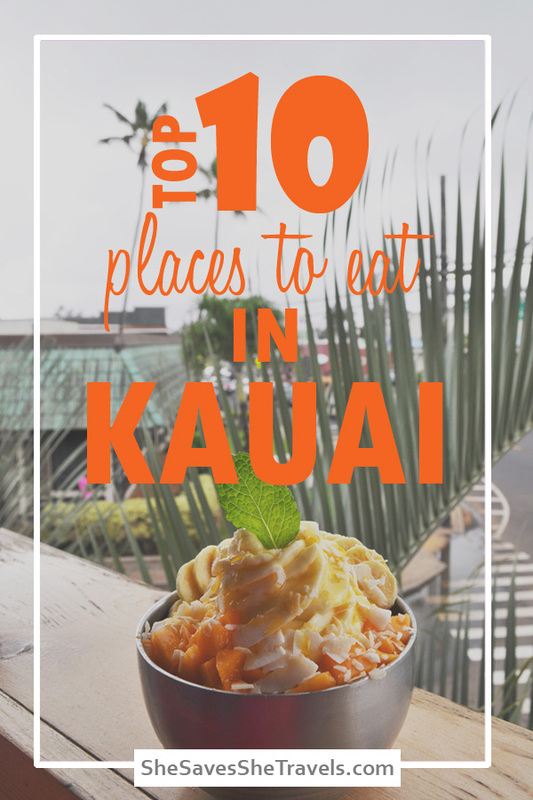 Here’s my run down of the best places to eat in Kauai. On this list you’ll find recommendations in Poipu, Kapaa, Lihue and Waimea. I stayed in the Poipu area but ventured to many other parts of the island during my stay on Kauai. 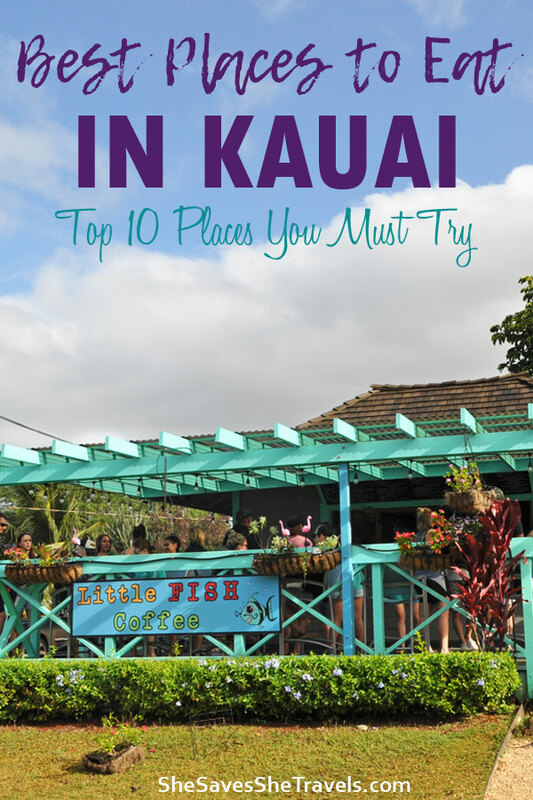 Also, if you’re looking for things to do while on Kauai, check out this guide. Alright I have to start the article with my favorite breakfast place on Kauai. During our week-long trip on Kauai, we spent three of the mornings eating at Little Fish Coffee in Poipu. Their name says coffee, but this place has so much more to offer. The highlight was their açaí breakfast bowls! Each bowl had a unique mix of toppings including fruit, granola, proteins and more. It was the right amount of healthy foods plus sweet treats to enjoy for a balanced breakfast on vacation. If you grab a açaí bowl, don’t let the size fool you. The small bowls are very filling and you could probably feed a family with the large option. Now I can’t recommend Little Fish Coffee without mentioning their coffee options! I’m actually not a coffee drinker but I know the coffee grinder was always going at Little Fish Coffee. My fellow travelers loved their fresh brews, their favorite being the Mexican Mocha Latte on their signature coffee menu. Little Fish Coffee also has smoothies that could please pretty much anyone, and a great variety of breakfast sandwiches to fill you up before your adventures on Kauai. Note: I enjoyed the location in Poipu but they have a second location in Hanapepe. Don’t let the name fool you… Da Crack is one of the best places to eat in Kauai, and perhaps my favorite dinner place! It was recommended to us by locals, and it was amazing. They serve fresh, hot Mexican food and you can easily get a meal for two for less than $25. That’s tricky to find on Kauai! The servings are large though, so one taco per person or a burrito to share will do it. The meat tastes like it’s been marinating for days and all the toppings taste super fresh. Note: this is a to-go place only, so you won’t find any tables. There are a couple of benches you could grab if they’re free. Eating Da Crack out the back of your SUV is definitely acceptable on Kauai. Better yet, grab some tacos for dinner and catch the sunset! Okay I couldn’t decide on the best food truck in Poipu so I’ll recommend the food truck park as one of the best places to eat in Kauai. 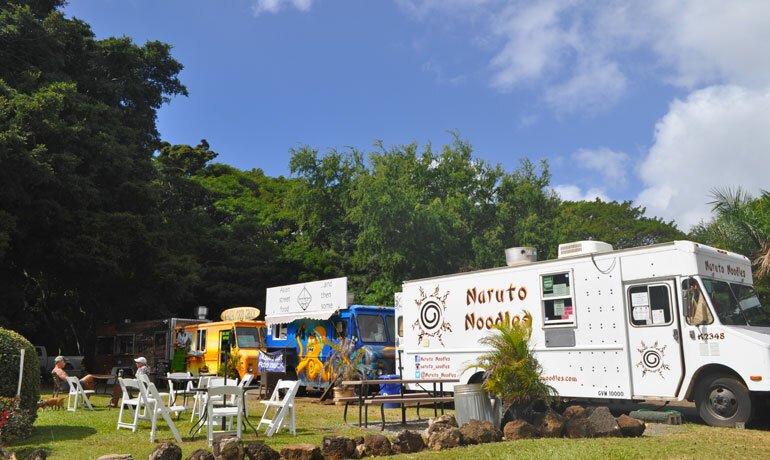 The group I was traveling with enjoyed lunch at the Poipu food truck park off Koloa Road. We ate fish at Kauai Food Truck and sandwiches at D-Green’s BBQ. We only ventured there once, otherwise we would have loved to try the other two food trucks. The Poipu food trucks pricing ran around $10-$15 each per plate, so you can get a good meal at a decent price. If you’re going through Waimea to hit the trails and lookouts of Waimea Canyon (which I highly recommend), make sure you stop in at Gina’s place for lunch. It’s a quaint little restaurant with home cooked food. They’re known for their Loco Moco. A Hawaiian favorite meal, it’s basically a hamburger patty served over rice, topped with eggs and gravy. Gina’s at Yumi’s is also known for their cheeseburgers as they serve Kauai grass-fed beef. The best part about Gina’s is that you can get almost anything on the menu for less than $10! Stop there on the way up Waimea Canyon to fuel your hiking adventures! You will never have to persuade me to eat frozen yogurt, ice cream or gelato. So when I ran across @thespotkauai on Instagram months before my trip to Kauai, I knew I needed to check them out. I’m a sucker for health food, so I love that they have lots of options. Add some fruit, frozen yogurt and açaí to a bowl and you’ve got a perfect afternoon. Enjoy your sweet treat outside on their lanai overlooking the town. I visited their location in Kapaa but they also have a location in Princeville. Their Princeville restaurant also has a full espresso bar, in addition to the soft serve frozen yogurt. 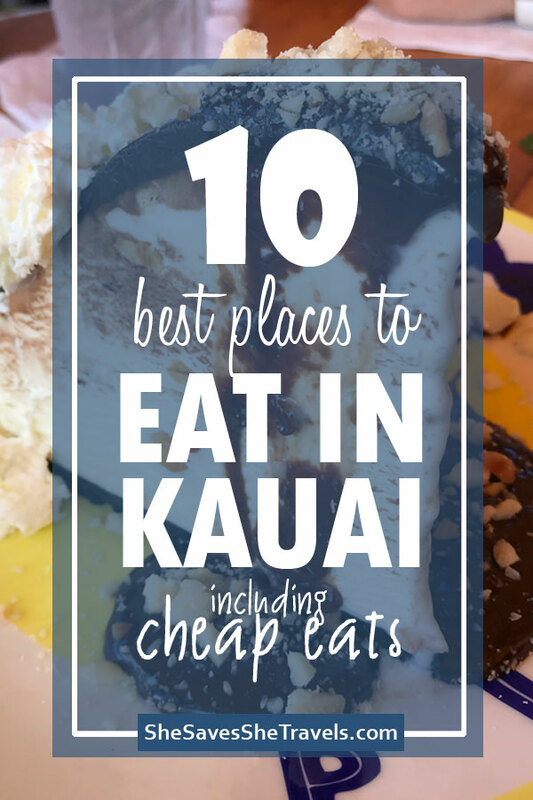 Make sure The Spot is on your list when you’re on the island, because it’s definitely one of the best places to eat in Kauai. Up in Lihue, there’s a strip mall with a pizza shop tucked inside. This place is one of my favorites on my list of best places to eat in Kauai because of its delicious and affordable pizza. The pizzas are twelve inches in diameter so you can get one for two of you to share. The vibe is casual and a great place to enjoy a cold brew with friends. Watch your pizza being made in the open air kitchen and brick oven. It’s like a little slice of Italy in Hawaii. I opted for the gluten-free crust which was quite delicious! 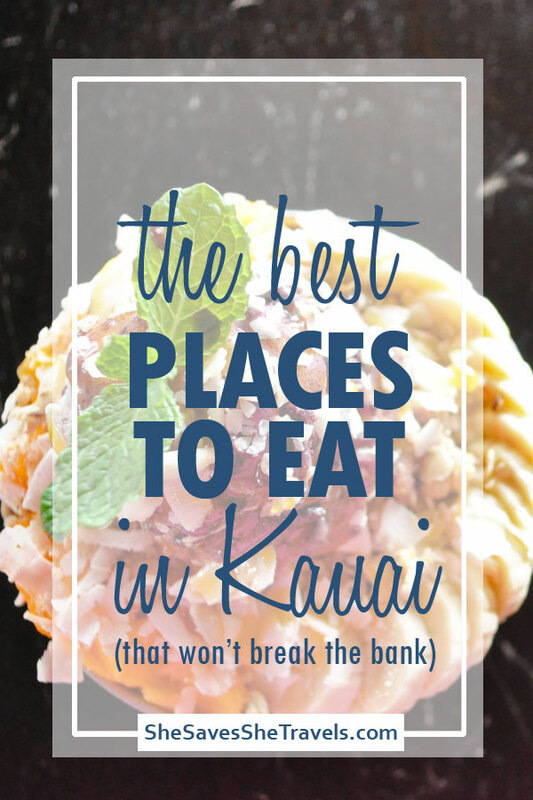 If you’re heading to Kauai, you’re going to run into a lot of delicious seafood. The dinner we ate at Brennecke’s is no exception. Now, this dinner was more pricey than most of the others on this list with dinner plates starting at around $30 each. But seriously, try the macadamia nut crusted mahi mahi. They’re known for this dish and they cook it extremely well. The fillet of fish was larger than I expected and was quite filling. Oh, and you’ll probably have many opportunities to try a Mai Tai, but Brennecke’s is one of the best. They’ve served over 1,000,000 of them so they’ve got to be good, right? If you go to Brennecke’s during the day, grab a table by the windows and enjoy a view of the ocean from your seat. The restaurant is right across from the beach, so you can enjoy the breeze as you grab a bite to eat. 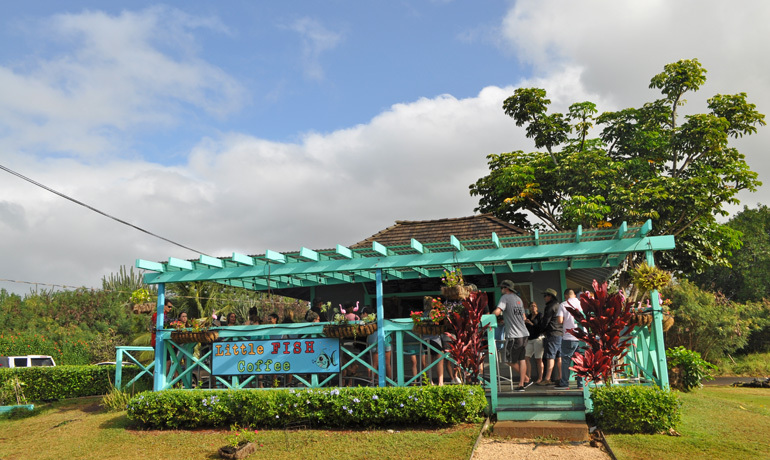 If you’re looking for a great restaurant with a tropical setting, Keoki’s Paradise is your place. With a variety of steak and island favorites, you’re sure to please everyone at Keoki’s Paradise. Make sure to make a reservation a few days in advance because they fill up early! Keoki’s Paradise is a bit on the high end for price, but if you go right before their dinner rush you’ll get to enjoy their Chef’s Tasting Menu, which includes an appetizer, entrée and dessert for $26. The portions are a little smaller but so is the price so it’s a great option! 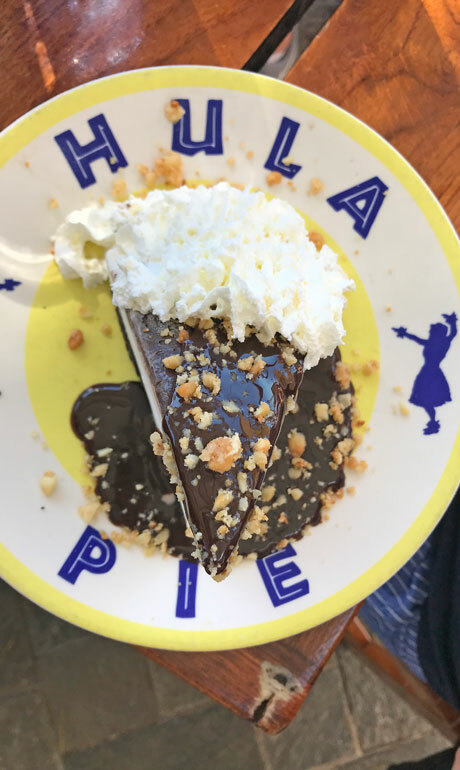 If you get to Keoki’s Paradise you absolutely must try their Hula Pie! 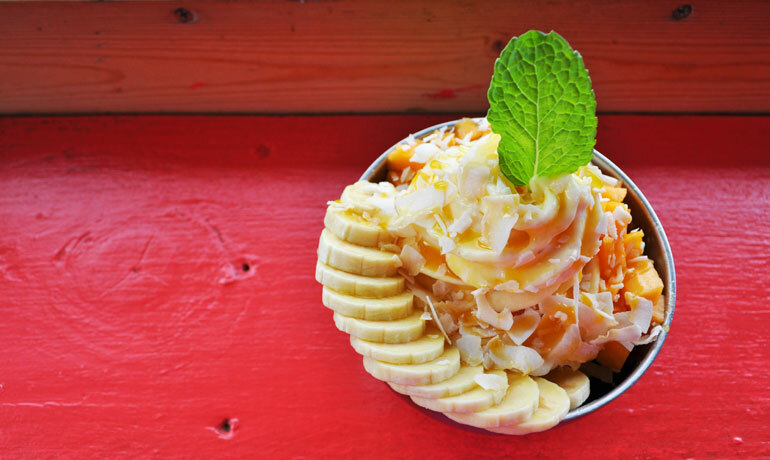 It’s a favorite dish among visitors, and my favorite dessert in Hawaii. Hula pie is macadamia nut ice cream layered on top of a cookie crust, with layers of hot fudge and whipped cream. You absolutely cannot go wrong! Make sure to get it to share – one slice is rather large and can be split between two or even four people, if you’ve just had an entrée. If you’re serious about fish tacos, you’re going to need to check out Sleeping Giant Grill in Kapaa. The secret is in the breading. Wrapped in a soft tortilla, each taco is like a little slice of heaven. Enough said! While many places on Kauai have outdoor seating, Sleeping Giant Grill does it right for the cost-conscious traveler. They have a BYOB policy so grab yourself a beverage and enjoy a delicious meal without the hefty price tag for drinks. My last recommendation is to eat as much fresh fruit as you can in Kauai. The pineapple was my fave and it just doesn’t taste the same anywhere else. 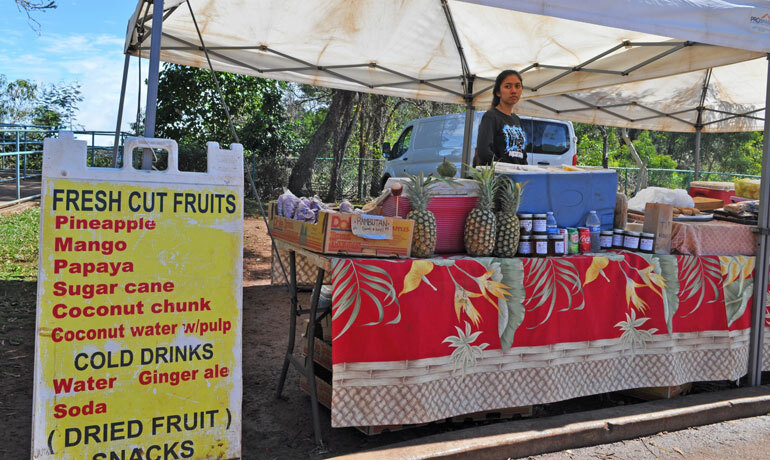 Don’t be afraid to stop at a roadside fruit stand as you explore the island. You could taste the best pineapple of your life, incredible banana bread or a variety of other goodies that might just hit the spot! One last recommendation to find great restaurants in Kauai is to ask a local resident or check out the reviews on TripAdvisor or Google. Lots of reviews even have the menus included from other customers photos, which is helpful if you can’t find a menu online. See…I think I’d go to “Da Crack” not despite the name, but because of it LOL. 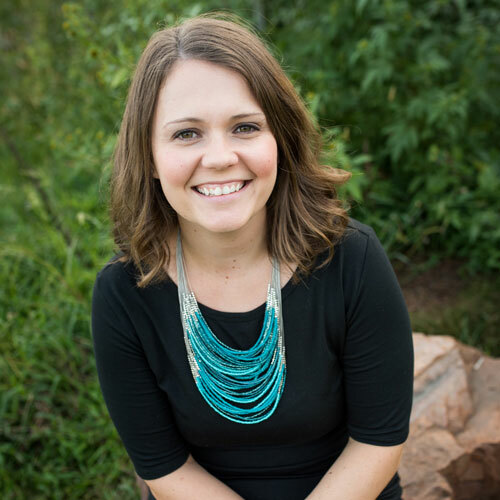 I’m all about fish tacos – so definitely would check out Sleeping Giant! Hula pie sounds/looks unique and something that I’m immensely sad is not within my direct vicinity at the moment. Hoping to get to Kauai in the next two years, and when I go, I’m going to try these three for sure! 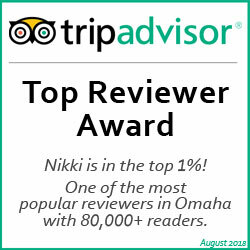 Thanks! Haha this is great! 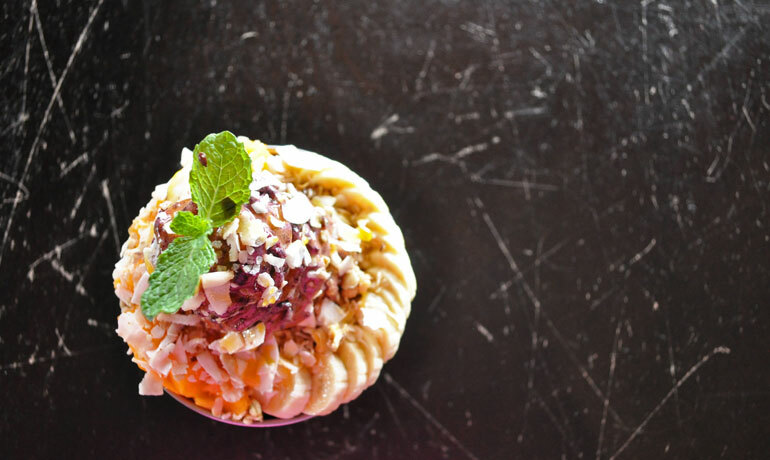 Kauai has amazing food….Hula pie included! Hope you get there soon! !